Restoration Project Code Name: "New Love"
Around the world there are thousands of happy Jeep owners to whom the Jeep has become an important part of their life. Every Jeep owner has his/hers own story from the day they saw the "love of their life" ( the Jeep obviously ), from transporting it home for sincere love, care and restauration. Previously we startet the description of "Project Code Name: Rusty Jeep", where one of our members, Flemming, living on the little island in the Baltics, Bornholm, had decided to basically build up his Jeep from absolute scratch. He got the WW2 chassis and the first parts for his project and everything was nice and dandy. But then love struck again, when it came to his attention that in Norway was a WW2 Jeep for sale. The project suddenly changed and as he very soon found out that this was a fair example with not much rust.. he decided to go for it to basically speed up his restoration project. Below is the short story of Flemmings first encounter with his new Love of his life, which I am sure will recall many sweet memories with other happy Jeep owners around the world... doesnt the story sound familiar? Via the internet I discovered that a WW2 Jeep was for sale in Norway. NKR 55,000 was the price, which is a fair price, so I immediately called the owner and informed him that I was ready to buy. Unfortunately that was not possible as it had already been sold - I was informed. Sad, but nothing to do about that. However luck struck me, as the owner called me back 3 hours later and informed me that I could buy it if I still wanted to. So I immediately accepted. Now I had to organise payment to Norway and the freight down to Denmark. Fortunately, one of our other members, Poul, were able to help me out with the freight arrangement and on April 21st it arrived to Copenhagen. It was parked in a big dark hall in Copenhagen and I had to go and see it, so I went to Copenhagen to see my new "Love of my Life". Before I could bring it back to Bornholm I needed to make it road worthy and have it registrered on Danish registration plates. I agreed with Poul, that I should come back for us to get it sorted out at Pouls work shop outside Copenhagen. I was back in Copenhagen followed by my friend and other member, Ole, with whom I share a WW2 GMC. We were now getting ready to to drive the Jeep to Pouls workshop outside Copenhagen. The trip went almost OK, it only stopped 3 times. Already at this point of time, we could conclude that the generator was dead! Finally with some trouble, we arrived at Pouls workshop and it was now time for us to make the diagnosis and plan for the next temporary repairs. 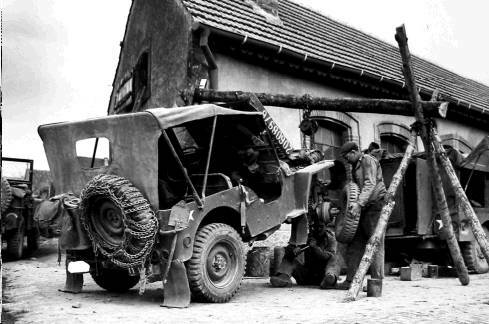 With the quite common "naivity" that caracterize all WW2 vehicle owners, we had booked time for the registration and check of the Jeep already 5 PM same day, so we were working under some sort of stress. Fortunately another of our members, Erik, had now arrived at the workshop so were now 4 people that could give the old Jeep the love and care that would allow us to take it back to Bornholm to start the real restoration. Focus was now mainly on all areas that needed to work for the Jeep to be approved for road worthiness. Steering wheel, Breaks and Lights. The entire electric circuit was a real mess and nothing worked as it was supposed to. However after some hard work we got it fixed so lights including break-lights, were all working for the test. Breaks worked OK, however the handbreak would not release. This was not good and a lot of effort was put in to get it sorted, however without much luck. Time was now up for the test and we needed to leave. None of us had a good feeling about the test and went to the test station with a bad feeling. However, the senior test officer, went for a drive and was OK with its performance. He went for a break test and it was perfectly straight... pheww. I immediately called my wife for her to book the ferry back to Bornholm that same night. As anything could happen from the test center to the ferry, we decided to leave right away and get on our way. Cheerfull and with a sort of happy, but unrestful feeling, we went on our way and thanked God that it was not raining as the Jeep was completely open. Approx 3-4 miles from the ferry port, the left rear wheel startet to smoke. We moved on at a lower speed. The break seemed to be stuck and it was overheating the breaks. 1-2 miles later the right rear wheel also startet to smoke. Now both rear breaks were stuck and things looked quite bleak. A very bad technical state and a terrible smell as well. We tried our best to release them, but with no luck. Time was not on our side, so we needed to continue and push it to the limit. I was "crying" inside as I know how I totured the old Jeep, but what could we do; stuck in the middle of nowhere, in the middle of the night, only with light for a limited time... We simply needed to continue to the ferry. Finally we reached the ferry and got on board. Our stress level had been exceeded long time ago and blood pressure above what could be considered healthy for most of the day. So the rest on the ferry through the night was indeed needed. Next morning when we arrived in Roenne, we drove all the way home without touching the breaks at all.... We made it. Finally safe at home, we immediately lifted the Jeep up and could conclude what we expected.. all breaks out of order. The main break cylinder did simply not work as supposed to and it had apparently been a miracle that the Jeep had proven to break straight at the test center - or maybe this was where it got stressed followed by malfunction. 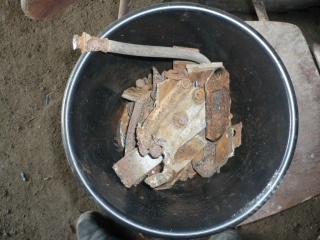 Over the summer I have now repaired all breaks and renovated the main cylinder. All electric circuit has now been renovated and it is now a completely different Jeep. The absolute best with this Jeep, is that it is 100% free of rust... and that is a very good beginning. Below are some photes taken during the initial restoration process. Still some way to go, but I guess that is the way it is supposed to be - a never ending story driven by passion. What is more inspiring than to start on a new renovation project, which might at first seem confusing, massive, but also incredibly inspiring. It is all about enjoying yourself during all the processes, big or small and to focus on the details. Often you need to find solutions that can not be found in any book all with the aim of bringing the vehicle back to original condition and not be exposed to pressure of time during all processes. This is the Log Book on such project where you can follow the process from a pile of rusty metal to a renovated WW2 Jeep. On the little Danish island, Bornholm, located in the Baltic Sea close to the sourthern coast of Sweden, lives one of our "WW2 Battle Site Digging Society" members, Flemming Koch. He is the proud co-owner of an old GMC which has been renovatede back to a beautiful state presented in "Our WW2 Vehicles" section. We have been given the opportunity to follow his renovation project of a WW2 Jeep,which will be headed by Flemming Koch mentored by another of our members, Poul Brink-Larsen. 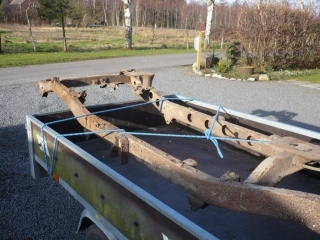 The first step will be to prepare the rusty chassis frame ready for sandblasting. 2,5 hour cutting or wrenching it unwanted parts off. The chassis might look a bit rusty, but there is a lot more life in that and after a good sandblast and paint, it is ready to be foundation of the further restoration. (See the nicely restored GMC behind another member Ole Andersen, the other co-owner of the GMC). Poul Brink-Larsen, another of our members, has ecently assisted Flemming in finding suitable spare parts for the restoration project and so far that include an original Oil Filter, Radiator and a Reduction Gearbox that is now lined up to be renovated. of the first projects for this season. Some of them are straight forward to deal with, where the more complicated, as the transfer box require some extra attention and time. At the picture to the right, you can see which parts Flemming has chosen for the projects for this season. From left to right; one of the PEDAL ARMS, the COMPLET STEARING SYSTEM, the OILFILTER, THE PLATE between engine and CLUTCH HOUSE, the FAN and least the TRANSFER BOX that surely will need some internal parts. Our member on <?xml:namespace prefix = st1 ns = "urn:schemas-microsoft-com:office:smarttags" />Bornholm, Flemming Koch, is also the proud half-owner of an old GMC. This GMC is in need of a new roof and holders, which Flemming has decided to make from new in stead of buying. Consequently, Flemming has embarked on a slightly different project, which is to create and customize a portion of the wooden structure, which obviously must be performed in real American Oak. Place the planks next to each other between to blocks of wood with 100 kg of stone on the middle to bend it down in a suitable curve. Then you start heating the planks up with the weed burner while you keep the planks wet. You keep heating the planks until they need more water. Then you pour more water on. Then you heat up the wood. Then your heat up the wood. Then you pour more water on..
Approx. 100 years later........you now have the most perfectly curved planks ready to mount on the GMC with the roof on top.